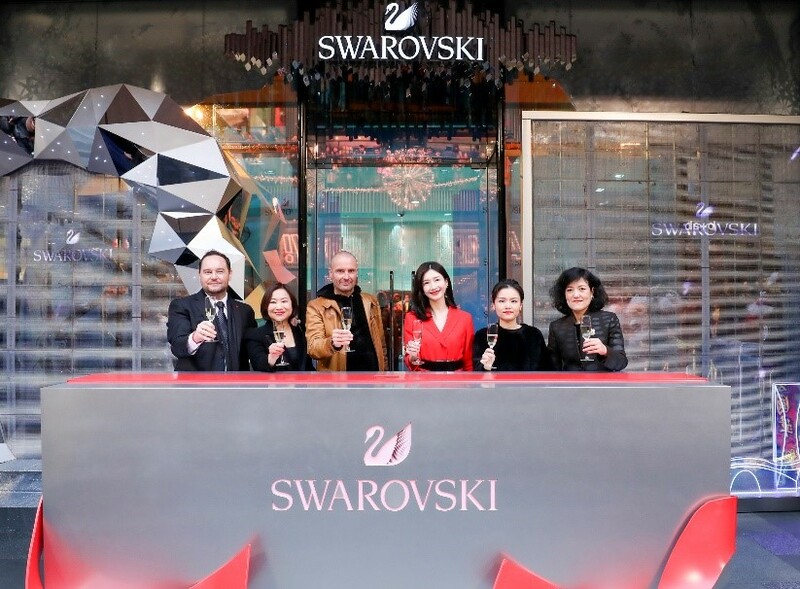 (January 18, 2019，Sino-Ocean Taikoo Li Chengdu) At the beginning of New Year, Swarovski Sino-Ocean Taikoo Li Chengdu Forerunner Store had its glittering opening on January 18, 2019. Maggie Jiang, the Spokeswoman of Swarovski Asia, made her debut in Swarovski Chengdu Forerunner Store. Maggie Jiang, with Swarovski executive board member Mr. Robert Buchbauer - CEO of Swarovski Consumer Goods Business, Swarovski executive board member Joan Ng - Executive Vice President of Marketing, and Swarovski executive board member Michele Molon - Executive Vice-president of Omnichannel Operations, along with Judith Sun - Managing Director of China and Ms. Molly Wu - General Manager of Sino-Ocean Taikoo Li Chengdu delivered sincere New Year greetings and embarked on a sparkling journey with the present guests. 2019 ICONIC SWAN collection using the hot "Chinese Red" to present its most classic ICONIC SWAN for a sparkly surprise and deliver great festive blessings. The color of Chinese red, a symbol of fortune and vitality, makes the gorgeous Chinese charm even more blooming. 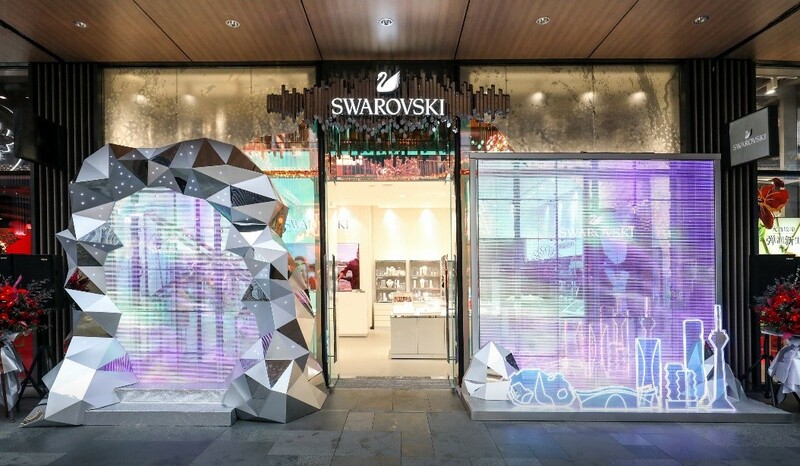 After a huge success of the first Swarovski Forerunner Store in Oxford Street in London, Swarovski China opened its first Forerunner Store in Chengdu just before the Chinese New Year 2019. 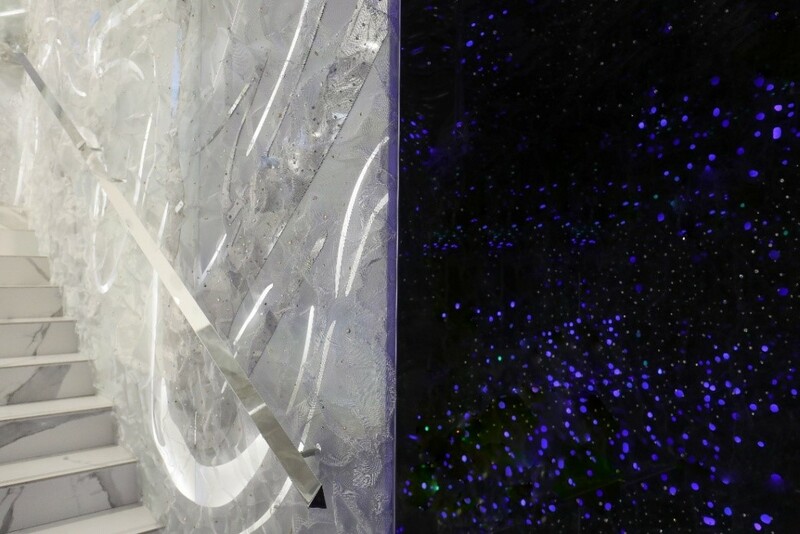 Differing from other Swarovski stores, the Swarovski Sino-Ocean Taikoo Li Chengdu Forerunner Store presents the advanced digital product display, intelligent shopper experience, and cutting-edge fashion style. 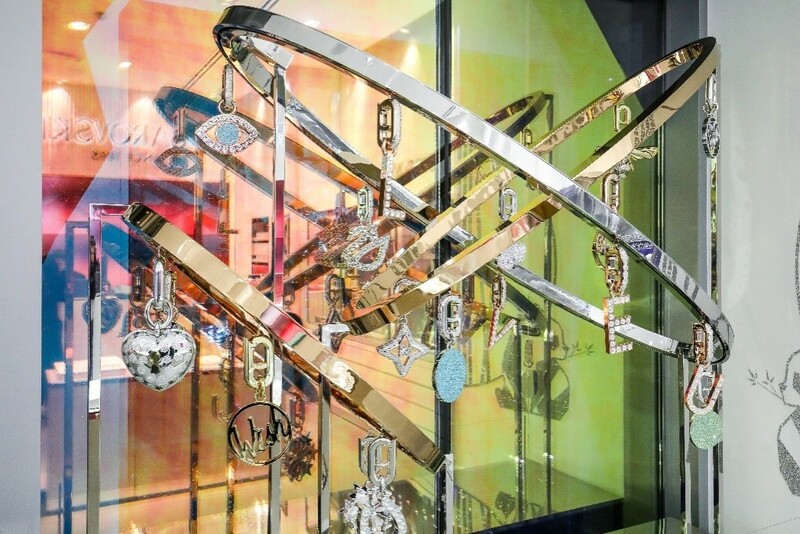 The Swarovski Chengdu Forerunner Store locates in the heart of City Chengdu. The Mountain’s Heart art installation was created by JuJu Wang, a well-known artist. The installation radiates the aesthetics of light and shadow, and is in sync with the unique sparkle of the brand. The narrow stairwell was made into a time tunnel to represent the splendid transitioning through the changing light and shade from sunrise to sunset. Also with dedicated gift-wrapping area to offer the best shopping experience. And resident stylists providing professional stylingadvise and gift service. Swarovski Forerunner Store features the color of silver white with a starry background right in the entrance, so bright and magnificent. When the viewers enter the store, the Mountain’s Heart is explored to them right away. The Crystal Valley is designed as a flood of bright white romantic space inside the purity of the crystals. Stepping on the stair, the wall cuts portraying wave crystals compose a fluid flow that enchants the public. The reflection in the mirrors, bouncing and reflecting everything, unleashes an interactive space where the viewer becomes part of the artwork. Along with the light changing from dark to bright in the stage of reverie, contemporary water shaped laser cuts unleash a free flow environment. Over 10,000 Swarovski’s crystal attached to the cave’s mesh guide the viewer’s way, connecting all the stages together into a complete whole and showing the splendid transitioning through the changing light and shade from sunrise to sunset. In addition to the dreamlike Mountain's Heart art installation, the window shop display is also very ingenious. Inspiration arose from the childhood moments, hanging crystal bells resemble small moving stars on a Christmas trail train. Just like the Remix collection, they mix together in an endless set of possibilities, as an interactive, fun and elegant installation. Swarovski Sino-Ocean Taikoo Li Chengdu Forerunner Store strives to build the most exquisite space in store design for customers. Besides, the reserved gift-wrapping Area has been added to offer the best shopping experience. The store dedicates to be innovative in service as well. There are resident stylists providing personalized stylingservice to every customer for a gorgeous and radiant look. In the opening ceremony in Chengdu, Maggie Jiang, the spokeswoman of Swarovski Asia, was wearing Swarovski red ICONIC SWAN bracelet and ERA JOURNEY watch, in a total red suit corresponding to Chinese New Year and layered with a black wide belt, presenting a clean and elegant glamourous look. Maggie Jiang shone like a goddess as she was also wearing earrings and the ring of Swarovski spring LUCKY GODDESS collection, crafted by the precision and the perfection crystal cuts with Moroccan golden embellishment. During the event, Maggie Jiang and Swarovski management board member Mr. Robert Buchbauer - CEO of Swarovski Consumer Goods Business, Swarovski management board member Joan Ng - Executive Vice President of Marketing and Swarovski management board member Michele Molon - Executive Vice-president of Omni-Channel Operations of Consumer Goods Business, along with Judith Sun, Managing Director of China, experienced the all-new store design of Swarovski Sino-Ocean Taikoo Li Chengdu Forerunner Store. OntheoccasionofNewYear, Swarovski Sino-Ocean Taikoo Li Chengdu Forerunner Store prepared the Blooming Chinese New Year illustration experience activity. 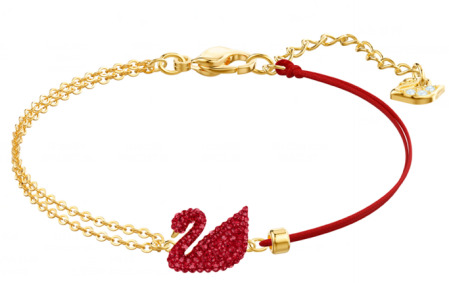 The new Chinese Red ICONIC SWAN collection made a perfect gift for the Chinese New Year. Adhering to the innovative ideas, Swarovski uses the hot "Chinese Red" to present its most classic ICONIC SWAN for a sparkling surprise. Red is the most quintessential festival element of Chinese New Year, and an emblem of fortune and all the longings for a new year. 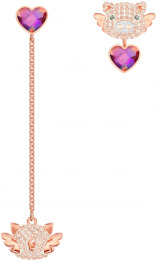 ICONIC SWAN collection has always been the representative works of Swarovski's classic inheritance. This time, the brand revitalized this collection and made it a splash by reinterpreting the elegance of Swans with the color of Chinese red that symbolizes fortune and vitality. 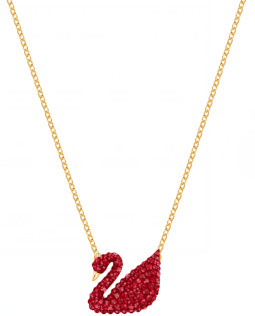 The red ICONIC SWAN necklace crafts in elegant gold-plated chain and red crystal swan pendants. 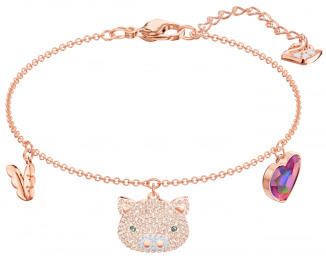 The bracelet features with half of the lucky red rope and half of the gold-plated chain in an exquisite shape, it sparkles charmingly with its elegant and unique design, perfect for Chinese New Year’s outfit. 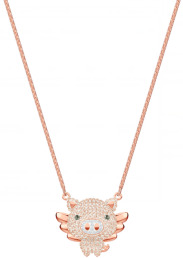 Swarovski also launched the jewelry features with motifs of 2019 Zodiac piglet. The cute and lovely design creates a happy atmosphere for the Chinese New Year and delivers great Festival blessings. In this new launch, Swarovski combines art and products in such a new way that it brings us a fabulous visual feast where romance harmonizes with exquisite craftsmanship, and creates an immersive shopping experience.